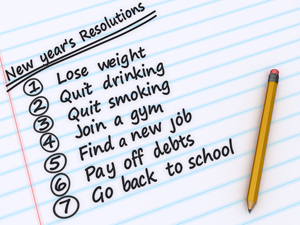 What are your typical New Year’s resolutions? I’m actually not a big fan of New Year’s resolutions, but I am a fan of using the beginning of a new year as an opportunity to reflect. As I look back on one year and then consider the next year ahead, it is an opportunity to step back and pay attention to the big picture—to pay attention to the things that matter most. As you consider this past year what have been your significant challenges and what has gone well? What are the key lessons you are taking from this past year? How is this look to the past influencing your goals and desires for the future? What Are the Big Rocks? The reality is we cannot do everything. We have to make choices. We have to prioritize. As I look to the year ahead, one of the most helpful metaphors for me continues to be the image of Putting the Big Rocks in First suggested by Steven Covey. I attended a seminar once where the instructor was lecturing on time. At one point, he said, “Okay, it’s time for a quiz.” He reached under the table and pulled out a wide-mouth gallon jar. He set it on the table next to a platter with some fist-si zed rocks on it. “How many of these rocks do you think we can get in the jar?” he asked. By this time we were on to him. “Probably not,” we said. So here is the major take away from Covey’s story: As we consider the hundreds and thousands of things that can be done in the year ahead, what are the specific things that matter most? What are the areas in our lives and the goals that we have that must be prioritized? Generally speaking, if we don’t carve out space and time for the things that matter most, our priorities often get pushed aside by the daily demands of life. So what are the things in your life that are just too important to be pushed aside? As I consider my own big rocks, some big rocks are priorities I desire for each new year—quality time with my family, treasuring Christ and His love shown to us in the gospel, and faithfully serving others through my work. Other big rocks for a specific year and require focused energy for a specific time in my life. One such example for me is working to complete a majority of my remaining MBA classes in the year ahead. In the coming year my life will be full of both planned and unplanned events. This means that I need to hold my plans loosely. But as I plan for the year ahead, I want to keep the “Big Rock” priorities in mind so that the things that matter most are not needlessly pushed aside by daily busyness. Some of my plans will likely need to change as I respond to new circumstances, opportunities, and invitations that emerge. But in the midst of the busyness, if I put the big rocks first I will be able to keep central the things that matter most and then allow the other necessities of life to fill in between the spaces left between the metaphorical big rocks. So what are your “Big Rocks” for the year ahead? Rather than making New Year’s resolutions, I’d encourage you to reflect upon and identify your priorities for the year ahead. This is not about making resolutions or promises to yourself that will fade away by mid-January; this is about a deep process of thinking through your core values and core goals, and then prioritizing what matters most as you move into the year ahead. Enjoy this opportunity to look ahead to the new year and then make your priorities explicit as you launch into the next twelve months. ← A Poem for Christmas — Enjoy! Reblogged this on Purpose in Leadership.